The pink slips are not done flying at Hewlett-Packard. Since being hired to run HP (HPQ) in 2011, Meg Whitman has overseen a dramatic downsizing that has cut about 55,000 jobs. The painful moves have been central to Whitman's efforts to turn around a once-iconic company. But Whitman is now warning more layoffs are likely in the near future, given turbulence in the global economy. 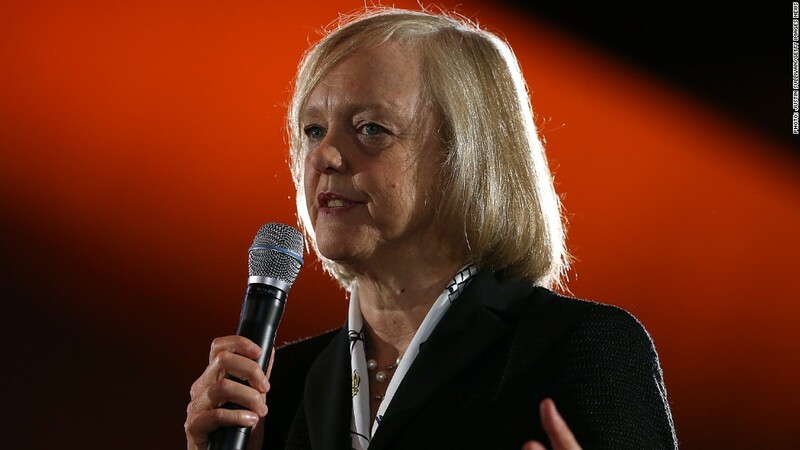 "I think we are through the vast majority but I suspect there will be more fine-tuning over the next couple of years," Whitman told CNN's Poppy Harlow in an interview at HP Discover this week in Las Vegas. Asked how many cuts are ahead -- Whitman declined to specify, but noted it will depend on how the economy fares between now and November 1. That's when the 76-year-old company is splitting itself into two publicly-traded entities. HP Enterprise will focus on hyper-growth businesses like cloud technology and cyber security, while the second company, HP Inc., will continue selling slower-growth products such as PCs and printers. Whitman said her team has discovered many ways to make both companies cost-effective, nimble and agile. "There is more work to be done to get to these companies exactly where we need to be," said Whitman, who will serve as CEO of HP Enterprise and chairman of HP Inc.
HP has already announced plans to lay off as many as 21,000 workers just in the past year. That's the highest number of layoffs disclosed by a U.S. company since March 2014, according to outplacement firm Challenger, Gray & Christmas. Leaner HP needed: The tens of thousands of layoffs have been "tough on morale," Whitman said. But she also believes many HP employees realize they have to be done, particularly given the lightning pace of change in the tech world. "I've never seen it move as fast," Whitman said, pointing to the rapid adoption of cloud technology, Big Data, cybersecurity and software-as-a-service. "We've got to be able to take advantage of those market trends -- and frankly shape the market trends," she said. Economic headaches: That job is being complicated by challenges in the economy -- both at home and abroad, where HP makes a big chunk of its money. "I'm pretty concerned about the U.S. economy. ... It's not a robust recovery," Whitman said. Whitman is also worried about the trajectory America is on. Top on her list of things that need reforming is the tax system and education policy. "We've got to fix our education system or we are not going to have the pipeline of science, technology, engineering and math" talent, she said. "If we're not careful this will not be the American century." Whitman is already seeing more weakness in the PC market this year than she anticipated. She blames that partly on an industry shift toward tablets and smartphones as well as on the volatility in the currency market, where the U.S. dollar soared in value until recently. The stronger greenback makes things sold overseas more expensive.